God is doing so much more than what meets the eye! That’s how I would summarize everything I learned over the past 20 years at World Vision. But it’s also true that our perspective is limited. On this Paul says, “Now we see only a dim likeness of things” (1 Corinthians 13:12). We can’t see the big picture, only what’s occurring at this moment in time. So it’s not always easy for us to believe that God is at work, especially for those of us immersed in global poverty – battling problems that have bedeviled human beings for millennia. As I prepare to depart my role as World Vision U.S. president, let me encourage you with this: Even when we don’t see results, even when we’re overwhelmed, and yes, even when we fail, God is still working through us. 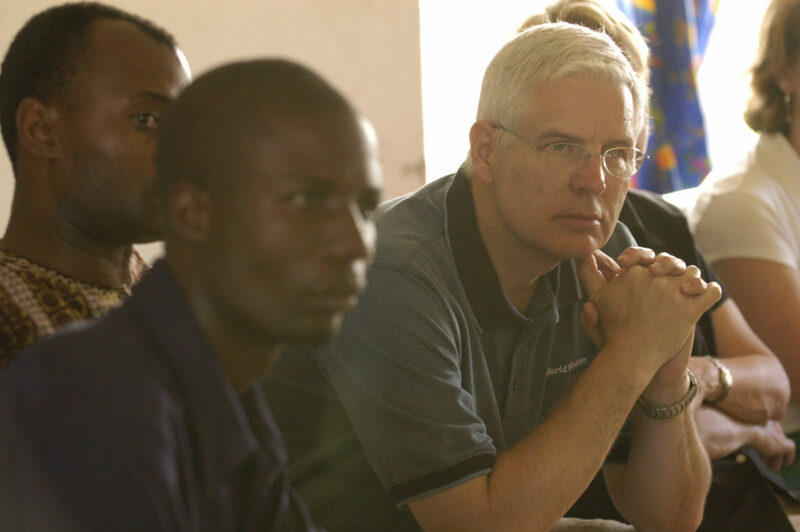 An example that I was fortunate to witness during my tenure is when World Vision took on the AIDS pandemic. Back when I joined World Vision in 1998, I was blindsided by the plight of 12 million orphans in sub-Saharan Africa. The disease was unquestionably a death sentence, wiping out whole generations. AIDS threatened to undo decades of arduous development work in African communities. Worst of all, most American Christians did not care. One national survey revealed that only 6 percent of evangelicals were willing to help orphaned children, the most innocent victims of AIDS. Despite that disturbing news, my colleagues and I believed that God was calling us to care for “widows and orphans in their distress” (James 1:27). And we couldn’t do it alone, so we had to change hearts and minds on this crisis. Our strategy was to take our case directly to the people. We conducted “Hope Tours” across the country, where I spoke alongside allies like former Surgeon General C. Everett Koop and the author Bruce Wilkinson. We invited pastors and donors, we met with newspaper editorial boards, and we notified members of Congress about these events in their districts. I’ll never forget one of the first Hope Tour dates in early 2003. We’d invited 100 pastors, and only two showed up. I was pretty discouraged. But at another gathering in the Twin Cities that April, 950 people showed up in the midst of a snowstorm. We raised $450,000, and more than 40 churches offered to get involved. I have to believe that lawmakers in Washington, D.C., took note of such a turnout. That same month, President George W. Bush unveiled PEPFAR (President’s Emergency Plan For AIDS Relief), his $15 billion plan to fight AIDS. He held a signing ceremony in the White House rose garden, attended by my HIV-positive Zambian colleague, Princess Kasune Zulu. She made front-page news all over the world when President Bush kissed her right on the cheek! Also noteworthy was an amendment added to PEPFAR designating 10 percent of funding for orphans and vulnerable children – the result of World Vision’s slow, diligent advocacy work on Capitol Hill. These efforts, alongside those of other Christian ministries, African churches, and celebrities like rock star Bono, collectively saved millions of lives and defeated the stigma of AIDS. And God was glorified! Abraham’s example – along with many others in the Bible – provides assurance that what God is accomplishing doesn’t depend on us. It involves us, but it doesn’t depend on us. God involved me in changing American Christians’ hearts toward those affected by AIDS, but that outcome certainly didn’t depend on me. He just needed me to be obedient and trust Him with the results. Remember this when you’re feeling discouraged or inadequate. Every time you send an email to your member of Congress, speak to a friend about justice, donate to a cause, or pray, God is at work. You can be fully persuaded that God has the power to do what He promised – and He is doing so much more than what meets the eye! 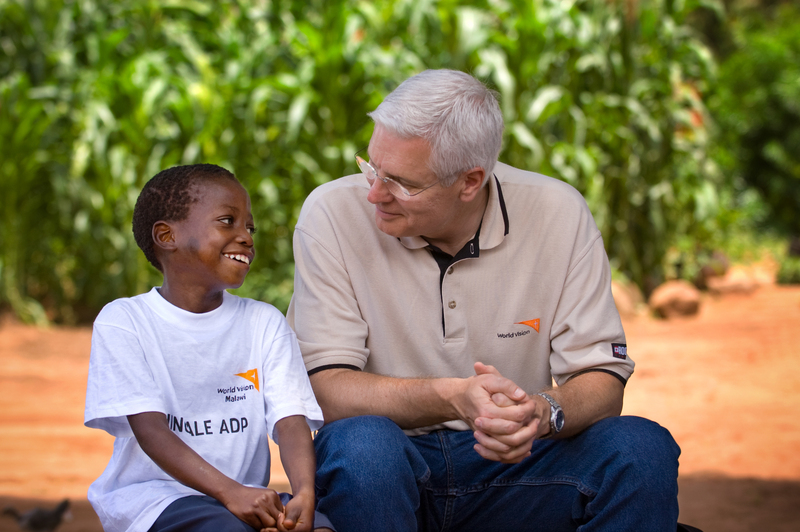 Rich Stearns, the longest-serving president of World Vision U.S., retires at the end of this year. He is the author of The Hole in Our Gospel and Unfinished. Follow him at twitter.com/RichStearns. Featured photo: In 2004, Rich Stearns talked with Leonard, a 10-year-old boy who was his HIV+ widowed mother’s last hope for care. ©World Vision 2004, Jon Warren. ← Saw World Vision in ‘Relevant’ Magazine? Learn more and take action! I discovered World Vision through Max Lucado’s book “Cure for the Common Life”. I’ve never felt better about giving in my life – ever. Thank you Mr. Stearns for your service and leadership. I can already hear the words “Well done, good and faithful servant”. Ten years ago, our church announced it would be participating in the Chicago Marathon through World Vision. We are not runners but my husband and I did it and found such joy because we knew it was for such a worthy cause: clean water for Africa. We never thought about this blessing very much; we were taking it for granted and didn’t even realize it. I silently say a prayer over this precious resource when it comes through our faucets now. We have a WV sponsor child too and have gotten more involved in our church’s Compassion & Justice Ministry as a result. Thank you for all you have done to be a part of God’s plan. Could there be a new book in your future? I became familR with Richard Stearns after reading A Hole In The Gospel and was convicted by his words and the holyspirit. God bless you and the next leader of World Vision. You have faithfully followed God’s will Rick- may you continue to inspire us all! Thank you for all you have done in your years at World Vision. After reading your book, A Hole in Our Gospel, I sponsored a child and have felt so much joy at the progress in her community and life. You have pointed me to Jesus and made a difference in so many lives. May God bless you and yours and grant you all: health, love, peace and happiness. Thank you Mr. Stearns for your love, commitment, tenacious spirit and service to the world. You have truly reflected God’s love to so many hurting people. I have had the pleasure to be a part of World Vision at one point & grateful to be able to serve in many ways our Lord & Savior Christ Jesus. Blessings to you & your family & may the incoming WV president continue to build upon what you have accomplished with God’s help. Hole in the Gospel was life changing for me and many in my Sunday School class. I have been a supporter of World Vision ever since. Thank you Rich Stearns and your family for your wonderful leadership and sacrifice over these many years. May God bless you richly in all of your future endeavors for the Kingdom!